These pictures are a little bit old now, but will make a good Monday post. 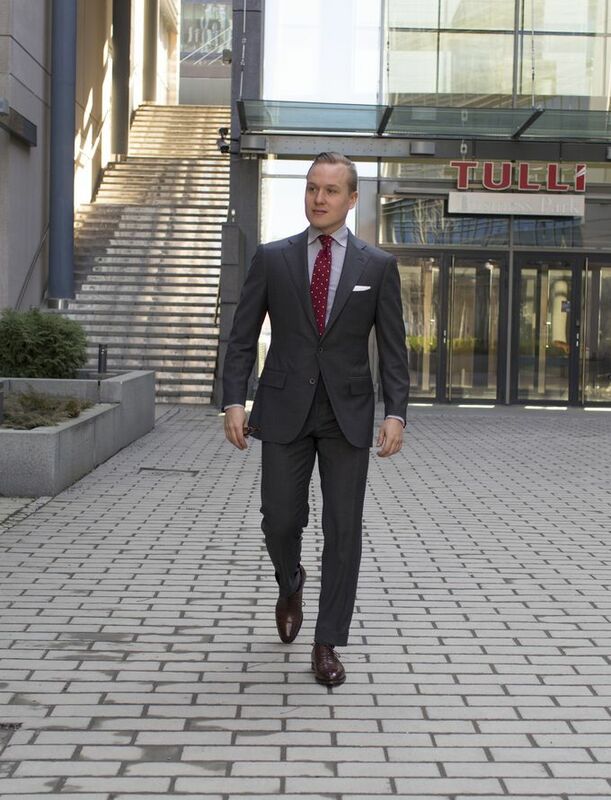 This is pretty much what I wear to work nowadays, and I think resembles something that goes well in any formal office. That said, it still has some nice touches like the soft lines of the suit, the raw silk tie, soft collars and the suspenders. Not too sprezz (which I don't really do anymore), but not boring either. So, the suit is from SuitSupply, the micro gingham check shirt from Barba Napoli, tie from SuitSupply (hands down the best tie I've ever seen from them), suspenders from Viola Milano, socks from Corgi and shoes from Alfred Sargent (for Herring Shoes). 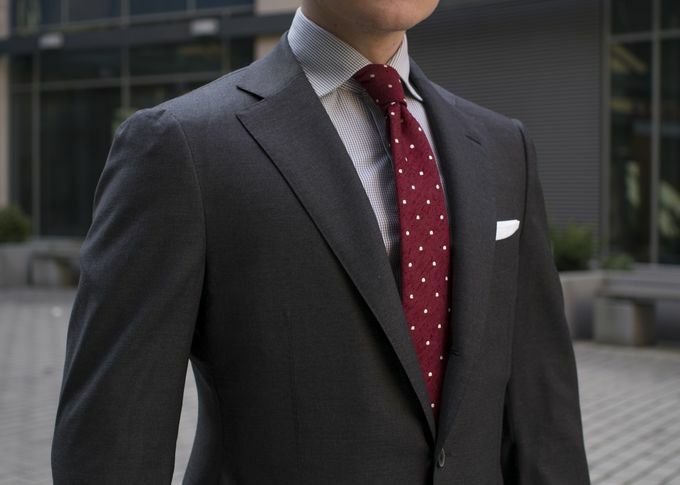 A burgundy raw silk tie with white pin dots - a great choice no matter what season. The shirt from Barba Napoli has a lovely collar roll. 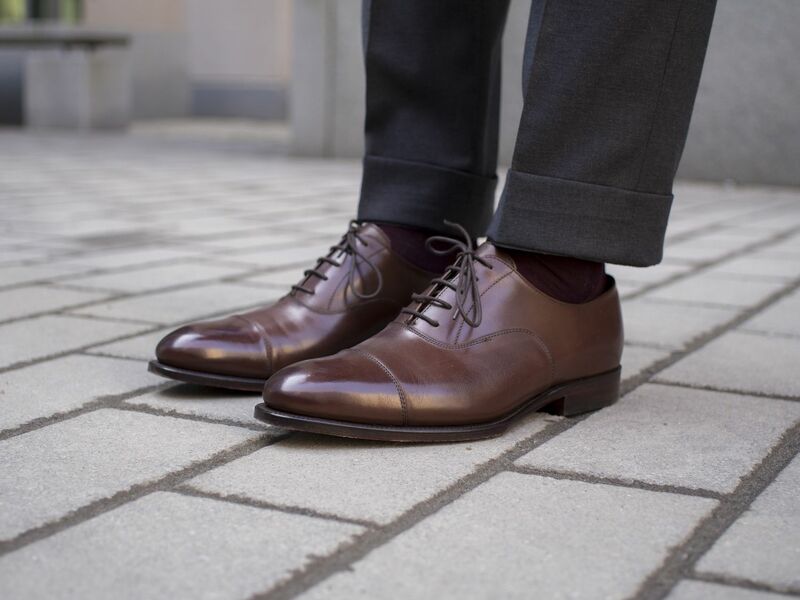 One of my favorite pairs from Herring Shoes (made by Alfred Sargent on their 109 last), together with burgundy Corgi socks. A bit more shine than I usually go for, too. Also, bear with me as I've been a bit busy lately, I have tons of emails waiting to be answered in my inbox. I'll get on that asap.